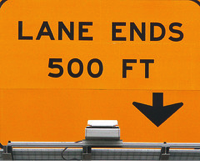 Lane Ends in 500 Feet!! Sometimes we encounter an alert like this in a routine spot in the normal road patterns of our daily travels. Other times it appears as an unexpected and unwelcome surprise as part of an annoying construction project, accompanied by flashing lights and barricades, clearly pointing out that we need to make an adjustment. Regardless of where it appears, it is a warning causing us to move in a different direction if we don’t want to find ourselves in a ditch. Maybe we need a sign like that when we are about to cross the 50 mark…and I am not referring to the speedometer in your car. When we hit that birthday marking the entrance to our fifth decade, many of us are forced to alter course, generally with no warning, even though we can argue that we should have seen it coming and better prepared ourselves. In many cases it is within the context of our career, when we find ourselves in the crosshairs of a layoff, a RIF, an early buyout…all code for “yikes, I’m out of a job, now what do I do?” Or it could be with our family situation as children leave for college, graduate and move out and on to adulthood. Whatever the case, we can view these situations as either unwelcome roadblocks to fulfillment…or as opportunities to chart a new path. Guess what? It won’t be as obvious as a sign telling you what to expect, but changes are coming – professionally, personally, likely both. How will you perceive the ones will that affect you? One way to ensure a more positive outlook is to be better prepared. Don’t get caught in the wrong lane running out of road. Here are a few suggestions on how you can better position yourself for the unexpected changes that surface in your life.